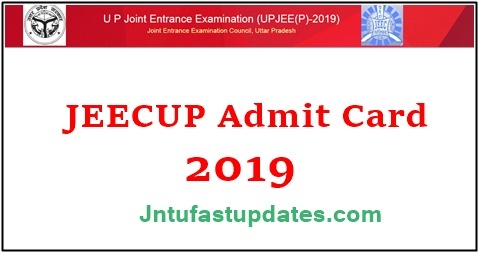 JEECUP 2019 Admit Card Download : Uttar Pradesh Board of Technical Education (UPBTE) is going to organize the JEECUP (Joint Entrance Examination Council of UP) examination on 26th May 2019 in morning and afternoon sessions. This year a large number of aspirants have applied for JEECUP 2019. Candidates qualified the test are eligible to get admission in Polytechnic courses. Students qualified the class 10th examination are going to appear for JEECUP examination every year. The UBTE is responsible to conduct the JEECUP examination in the state of UP. All the applicants enrolled for JEECUP exam 2018 can download JEECUP Admit card 2019 from the official website, jeecup.nic.in. The admit card is likely to be released in may 2nd week. Candidates can keep checking the official portal to download hall ticket. UP Polytechnic Entrance Admit Card :Uttar Pradesh Board of Technical Education (UPBTE) annually organizes JEECUP (Joint Entrance Examination Council of UP) examination for aspirants seeking to get admissions in Polytechnic courses in the state of Uttar Pradesh. Candidates those have qualified their 10th class examination are eligible to attempt this state level entrance test. The students will get admission into polytechnic courses strictly based on their rank. While offering the admissions, the preference will be given in chronological order. Candidates securing the best ranks will be given admission in the first phase of counseling. Candidates attempting the JEECUP Examination 2019 must download the admit cards and carry them to the examination hall. A strict verification will be done at the examination center. If Candidates fails to show the admit card, they will not be allowed to proceed to the examination. Hence without fail, all the applicants must carry the admit cards. Check the procedure to download the hall ticket from below and follow the steps to download easily. How To download JEECUP Admit Card/ Call Letter 2019 Online? Login with the user id, and password.